The dynamic and well-respected company has seen constant growth over the years and turnover has continually increased. This growth has resulted in the recent opening of a new head office and showroom, which is located at 31 Florence Nzama Street, Durban. Sherwin Ramlall is justly proud of the world class facility, which he says will take the business to the next level. The new office is easily accessible with parking readily available. As it is the logistics hub for the business; state of the art information technology has been installed which allows Sherwin to keep his eye on the daily operations. In addition, the spacious showroom allows for the effective display of many of the various sewing machines and other retail products on offer. The new showroom will cater mainly for the extensive distribution network of 664 dealers (and growing) which has been established country wide. The company even supplies its competitors. This network includes distributors in Namibia, Zambia, Zimbabwe, Mauritius, Lesotho, Swaziland and Botswana. 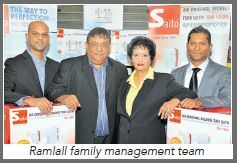 Ongoing consignments of sewing machines, which are available in supermarkets, are sent to Mauritius, which said Sherwin Ramlall is a fantastic achievement for the Durban brand. The company was established in December 1980 by Sherwin's father G "Ram" Ramlall and his mother, Lalita who still have daily involvement in the business. They will continue to manage the branch at 28 Queen City Centre, 54 Denis Hurley Street, Durban, as this store's clients form the heart of the business and quality customer service is intrinsic to their success. The Ramsi Group are worldwide owners of the Saito brand, which is a registered trademark, and are official distributors for Ricoma, FDM, Schmetz, Rich-X Jegon and Seco in southern Africa. The Saito brand of sewing machines, spare parts and lubricants is manufactured under license from The Ramsi Group. The Saito brand is a proudly South African brand, formulated and developed in Durban and trademarked in South Africa, in addition to being trademarked in East Asia and Africa. The Saito brand has been voted in the Top 10 in the KZN Top Business Awards in 2012 and 2013 respectively. In 2014, The Ramsi Group was placed in the top four in the Trade category. The company is one of only two distributors of Ricoma industrial embroidery machines for the southern African region. These machines are manufactured utilising the highest quality parts and electronics, as well as a very stringent quality control process. The cost of these sewing machine ranges from R120 000 to about R450 000. The machines are meant for mass production, which are of much value to small and large clothing and embroidery businesses. The Ricoma brand has proved so popular that The Ramsi Group cannot keep up with demand as the embroidery machines are already sold before they are landed. This division is headed by Shawn Ramlall who often visits the manufacturers to look at innovative products and undergo training in the machines operation. This ensures that The Ramsi Group has first-hand knowledge of the machines in its workshops and can advise clients on the operation techniques. Energy consumption and green technologies continue to be a driving force in many manufacturers' workshops. As such the company is now focusing on convincing customers who have industrial sewing machines to change from clutch motors to the eco-friendly range of sewing machine motors. The Ramsi Group has also recently introduced a range of LED bulbs, which are energy efficient. These innovations could save up to 70% in electricity, which has huge cost saving implications for clothing, linen and towelling manufacturers. The Ramsi Group has a special focus on supplying the home industry niche market and the addition of the embroidery machine is of value to this market allowing for diversification. The company has also worked closely with large international, local corporate and government organisations to provide sewing machines for rural community development. All of the Saito domestic electric sewing machine models have been tested and assessed as being compliant with South African standards for which letters of authority have been issued. This ensures that customers are assured of quality products. The Ramsi Group intends to continue to take strides through the combination of keeping up to date with technology and innovation to ensure that the company maintains its upward momentum for many years ahead. As such its directors are always on the lookout for innovative products, new markets and opportunities. To meet the needs and exceed the expectations of the domestic and industrial sewing machine market by offering efficient and excellent service together with superior quality products.